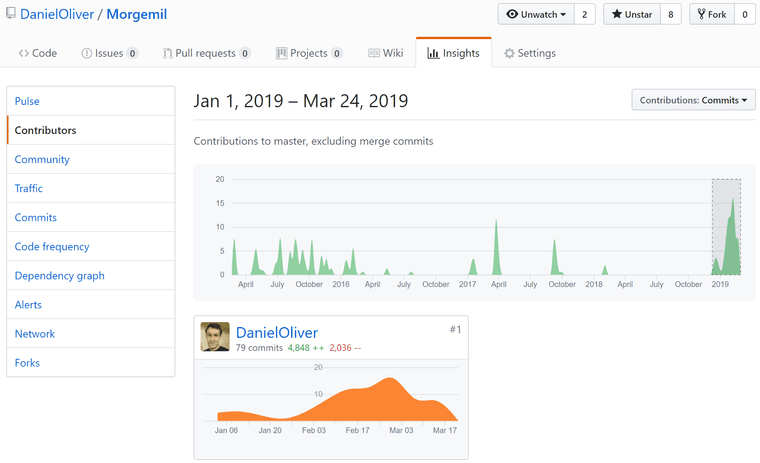 I've done 79 commits since the beginning of the year according to GitHub. Although progress technically started on Mar 15, 2015. This number doesn't mean anything to anyone. I just use it so I can look at the last progress update I did and be motivated because I am writing code, even if not all code directly becomes a very visual output. An interesting thing to note above is the events and updates that are happening on the background console screen. I've refactored the game engine so that the visual on-screen game and the actual game logic are separate. The game logic is behind an interface, which forces the graphical engine to communicate by passing messages. By doing game logic in a background thread, and only communicating with the graphical engine by messages of what's changed, I can now take this further and create a game server. Anything that implements that interface, whether a Web API or such, can now serve up game requests. Even further, to record a game I merely need to record the player's inputs. One difficulty has been in accurately recording changes to game characters. I can't miss any if I want to keep the front-end and the back-end in sync. I also want to display events on screen as they happen. Not every change should be a visual event on screen, and I also want events and other changes to be consistent with each other. When an event plays on-screen, only the changes so far should be apparent. And that's what led me to the below structure as a currently suitable representation of the timeline. Given an event, I also give the list of changes leading up to that event. With the Step structure above, I've added a history to some of my table implementations. With the history capability implemented in a few tables, my game loop has become a little wordy, but I get a lot of recording for free. Now if you notice, I'm doing a lot of "yield" inside a custom computation expression. Anytime I yield an ActionEvent, such as a character moved, I get a snapshot of the history on the table, and then clear the table history. Given all the history snapshots, I display it to the debugging console as show in the gif above. My code is here. I may not be doing a lot of things in a functional way of programming, but my code is always in a workable state and I'm constantly refactoring to make it better.